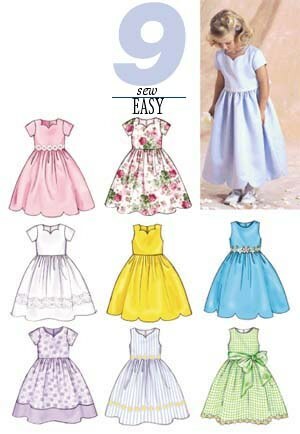 Slightly-flared dress, lower-calf, has fitted, lined bodice, dirndl skirt and back zipper. A,B,C,D,E,F tie-ends. A,B,E short sleeves. A,D,F,G purchased trim. B optional trim. E contrast band. G sash. Lt.wt. Cottons, Lt.wt. Satin, Lt.wt. Piqué, Seersucker and Taffeta. Unsuitable for obvious diagonals. Allow extra fabric to match plaids or stripes.